A live post from Trooperstown Hill. I'm sitting here at the summit of Trooperstown Hill admiring the views. I can't really add anything new that others haven't already said, I took the track at T163961 C and rambled up in about 25 minutes. 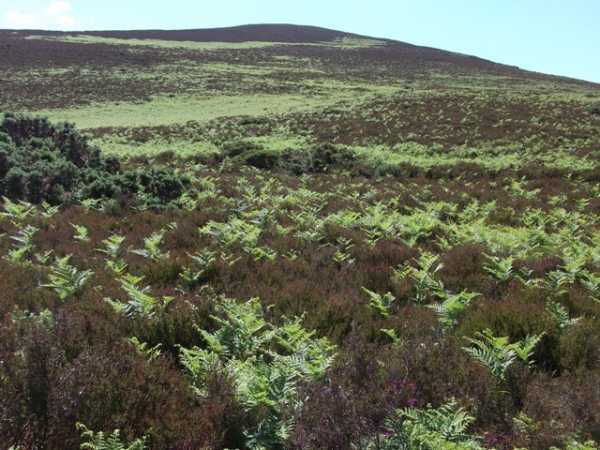 The north slope of the hill I walked up is a mixture of bright green ferns and brown heather. The angle of the sun was making the green of the ferns shimmer in a remarkable way that contrasted sharply but beautifully with the surrounding dark heather. These earthy colours are at their best in todays sunshine, and as I look at all the hills and mountains to the south, west and north I see these brown and green colours reflected on every summit far and wide.